When there seems to be no respite from the grey skies, but you want to get out and walk, you might just as well embrace it and choose a place where the bleakness is a virtue. 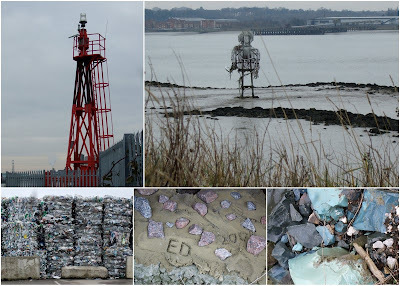 Prompted by Knit Nurse's post on the London Loop, we opted for the last section of the loop, the walk from Rainham to Purfleet, a walk that takes you from the outskirts of Rainham, under the A13 and through light industrial factories and yards to the riverside. After the first five minutes, you wonder what error of judgement brought you here. Roundabouts planted with sad, dead specimens, abandoned tyres, threatening signs warning of dogs in yards, razorwire bordered yards. Then an enormous fig tree on a scrap of land, catkins, lichen covered elders, odd decaying fragments of the estuary. The shoreline here is covered in a monumental amount of detritus - plastic bottles, washed up bags, wood, old toys. After a while you reach an impressive fluvial graveyard of concrete barges, used in the World War Two D-day landings. A part from a distant hum, it is very quiet, just a couple of people pass on bikes, a couple walking. There is a faint smell of sulphur in the air and, further on, the scent of damp pine from a yard full of pallets watched over by a scarecrow and stone owl. The marshes seem to recede, or maybe they are just covered by the recycling plant with its huge pile of compost steaming away like some giant christmas pudding. There is something sad about this place. It's been inhabited for centuries, exploited and raked over, a marshy bleakness littered with fragments of beauty. At least it doesn't bother the birds. You might notice a flaw in all of these pictures. I've obviously got a speck of dirt behind the lens; my other camera is similarly afflicted. Sorry! I do like the sound of the barge graveyard, and Rainham Marshes is definitely on my list for visits in the near future. The gritty urban realism does sound a bit like the stretch out of Gravesend, although perhaps even less relenting! I must say that the walk felt much longer than four and a half miles, though it is hard to tell whether this was because getting k to the river took longer than expected (we kept stopping to take photos); or the greyness of the day. The RSPB reserve is definitely worth a visit. There is a good viewing window in the cafe where you can use their binoculars; but better if you go out on the marshes with your own, I expect. Why is a lost teddy sad and a broken or lost toy only tacky? I really love the word picture of a Christmas Pudding of Compost! We are big fans of the Rainham marshes RSPB reserve. A circuit is a good walk length if you have children who regard walking as a form of torture. Particularly like the relics from the shooting range. We also enjoy seeing the eurostar train go past as we walk around - knowing that the same train goes directly under our garden in Stratford!